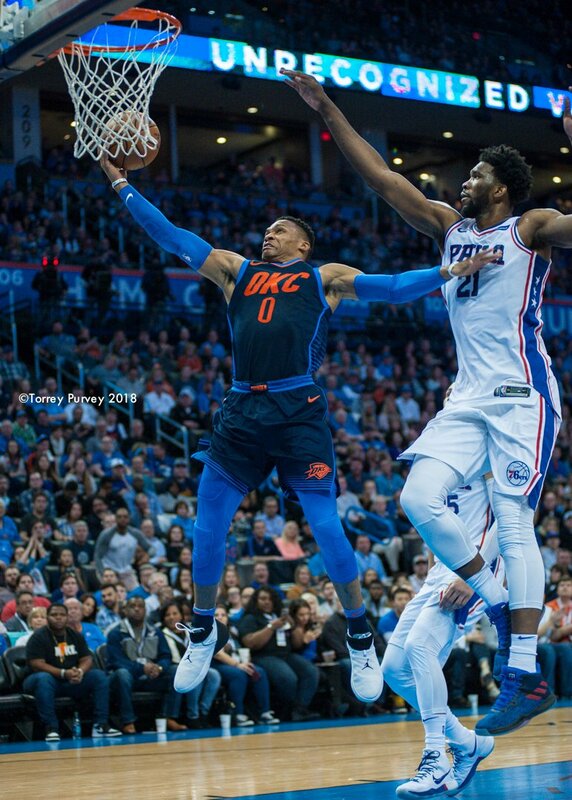 An early tip in Oklahoma City against the defensively stout Philadelphia 76ers on the second night of a back-to-back raised plenty of questions, especially after losing Andre Roberson to a ruptured patellar tendon 24 hours before. All the adversity that faced them didn't prosper as they defeated Philly 122-112 for their eighth-straight and 30th victory. The word for this victory is resilience. The amount of resilience they showed was impressive. The perplexing thing is that the Thunder didn't play great defense for the entire game, hence the 112 points given up but they stepped up when the game demanded them to. Knowing they needed to get off to a quick start in the first quarter, their defense turned into offense and the Thunder went on a 10-0 run to go up 25-18 halfway through the period. After Joel Embiid showed up Russell Westbrook with a monstrous dunk up-and-over the MVP, the 76ers went on a small run of their own and ended the quarter down just two points. The energy from Embiid's dunk carried into the second quarter. Between Russell not shooting well, the ever-increasing intensity level of the game, and the 22 second quarter free throw attempts it looked like Philly may get the upper hand on OKC with all things considered. But a 6-of-20 start for Westbrook turned into 10-of-25 before halftime and the Thunder closed another quarter out well, pulling within one point by halftime. After trading baskets through the third quarter and Philly scoring at will it was evident the Thunder missed Roberson's significant impact. Things didn't look good. Once again, OKC's resilient identity outshined the bad. Late in the third quarter, their defense stepped up and they capitalized offensively by going on a 12-0 run to take an 86-79 lead, en route to a nine-point lead entering the fourth. In this game of runs and a crippled defensive attack from OKC, Philly started the final quarter on a 10-2 run against the Thunder's bench and trailed by just one point. Philly seemed to get what they wanted from OKC during that time, despite the bench playing well during this seven-game win streak. That was until Westbrook and George checked back into the game. Immediately, seconds after Westbrook checked in, he went the length of the court for a two-handed slam and that's the spark OKC needed to finish off the 76ers. George, Westbrook, and Adams were a wrecking crew to finish the contest. George held down the defense, playing twice as hard without his counterpart, Roberson, while Westbrook and Adams took the game over offensively. Westbrook scored 12 of his 37 points in the final 9:35 while Adams scored 10 of 20 in the final 10:20. With Russell marching around the court authoritatively pumping up the home crowd like they were his teammates, the energy in the Chesapeake (Energy) Arena was at a season's high. Between those two factors, Philly had no answer for the resilient Thunder who eventually pulled away in the final minutes, while Philly only scored 10 points in the final 6:30. Westbrook added 14 assists and 9 rebounds to his game-high 37 points and George scored 31 points and added four steals. Adams finished the game with 20 points and 13 rebounds against Embiid, who's known for his defense. This marks OKC's eighth-straight victory and the undisputed pinnacle of the season thus far. They'll get a chance at their ninth-straight victory on Tuesday against the Washington Wizards (27-22), who they beat less than a week ago at home.